Asthma is referred to as a chronic lung disorder according to medical institutes. Asthma is characterized by erratic, recurring symptoms such as improper breathing cycles, inflammation of respiratory organs or tiny particles that block the bronchial passage. The cause of asthma can be identified through different cases. Either environmental, genetic or gene-environment types of interactions cause asthma to trigger. CO2 bronchodilationWith the first symptoms of asthma (wheezing, chest tightness, dyspnea, labored breathing) sit down in any comfortable chair, couch, sofa or divan. If there are no objects to sit on, sit on the ground or floor, on your knees or with crossed legs. Relax all your body muscles. Next, hold your breath for about 3-4 s. You will get air slight hunger or desire to breathe more. After this, instead of taking your usual big or deep inhalation, take a slightly smaller inhalation (only about 10-20% less than your usual inhalation). Then immediately relax all muscles, especially upper chest and all other breathing muscles. Take another (smaller or reduced) inhalation and again completely relax. With each breath, take a small or reduced inhalation and then completely relax. Maintain air hunger. The goal is to preserve this comfortable level of air hunger for 2-3 minutes. The breathing can be frequent during this reduced breathing but this is OK. 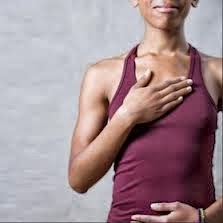 If you do the exercise correctly, you will notice that your chest tightness, wheezing, dyspnea, and other symptoms will subside or disappear. The Butekyo method was discovered by a Russian doctor in the mid 1950’s. This method is almost the same as the “breathe re-training” method and the only difference is that in practicing the Butekyo method, you have to follow a couple of steps in order to train yourself. Firstly, take two normal breaths. Secondly, breathe in and hold your breath. Have a timer with you to check how long you could hold your breath. After holding it as long you can, slowly breathe out and check the time. Normally, a person could hold their breaths from twenty to twenty five seconds. If a person could only hold for less than twenty seconds, it is a possible sign of breathing disorder. Thirdly, try to breathe through the nose. Keep doing this exercise for about five minutes.Repeat the cycles five times a day for the whole week and maintain the proper breathing while doing so. Breathe re-training is a type of exercise which proves to be highly effective in controlling asthma symptoms. This is done by maintaining a certain “rhythm” on your breathing patterns to “reprogram” the brain. In doing this method, the brain could get used to the breathing patterns and eventually lessen the chances of having an asthma attack. Taking vitamins and natural herbal remedies as a replacement for clinical medication is a natural way of healing the infection. Taking vitamins is a good way of treating asthma. The advantage of doing this is that you also heal the other internal organs naturally because of the other elements present in natural herbs.